So now, the day after it was announced that Peyton Manning's streak of consecutive starts would end at 208, Chris Mortensen is reporting that Manning had "cervical neck fusion" surgery this morning. Mortensen also tweeted that the procedure has a recovery period of a minimum of two-to-three months. 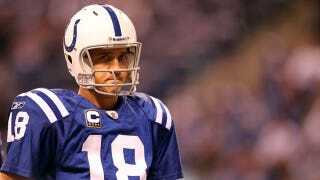 All of which means the Colts' troubles—to say nothing of Manning's—are much worse than anyone initially imagined.